you very much everyone. I am thrilled beyond measure. Link to the people who gave you the award. people I might have left out. 12 is not enough. so many, many people whose work I love. If I forgot you that's exactly what happened. an easy one, I know that's true. Labels: Blog 751. Sunshine Award. My blog people. street scene. acrylic on canvas. Toronto. Canada. I love the bold blocks of color in this one (especially the reds)! Congrats on the blog award too! You can just feel the sunshine in this piece. Love it! Thank you for the award Barbara and your kind comments on my portrait attempts - means alot coming from you! I just found your blog and WOW!! Love your colors - they are so rich and yummy! I look forward to visiting often! Congratulations on receiving the Sunshine Award! I have been busy lately and not getting around to visiting my blogging buddies lately and look what I find when I do! I love this painting of yours. It is so charming and happy. It's simply delightful. Love it! Brilliant light and brilliant painting! Love it. I think you may have a painting that can bring spring to your area! The contrasts and colors are in perfect harmony and you make it look easy. I love this painting! Love it! I know this light. I have seen this light and you have used your paints to describe it so well. Congratulations on this beautiful piece of artwork and the blog award you were given. And thank you for including me in your list of blogs to pass this award on to! I appreciate it so much and I appreciate you for all of the generous support you have given me since I began my bloggy adventure six months ago. All of the artists on your list are wonderful and I am honoured and surprised to find myself among them. You live on a special street called Cherrywood and you have two cherry trees in your backyard and your darling Steven makes yummy cherry pies and you do these fabulous street paintings that keep getting better and better. This sun filled one is a stunner! 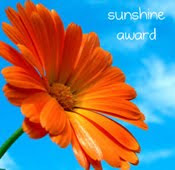 Thank you so much for the sunshine award. I want to soak up as much sunshine as I possibly can . I become so wan and pale this time of year. Thank you so much. Your paintings dazzle me. Thank you so much. I am so glad that you like it. Thanks for the congratulations too. Your portraits are fantastic. I don't know why you call them attempts. They are works of art. Thank you so much for your congratulations and I'm so glad you like my blog. I chose you because I really like your paintings and I am completely blown away by your writing too. The description of you and your husband trying to hold the water pipes together. The best. For a portrait artist painting the street is a holiday. I guess I've been on holiday. Will this bring spring? I could have done the whole theme again today using pink, because the end of day light was a deep rose colour. Spring must be coming. Well -- officially it's just a month away. Yay! Here's to rain for you and for us. No snow is not a good thing for growing things. Our plants need that water, and it isn't there. You are so one of the excellent artists in this world. Believe it. I think you do. Thank you so much for recognizing the light. I'm thinking of going back and darkening the shadows. Not sure. It's right back at you for the support. Thank you for your kind encouragement of me, and for teaching me about blue. Close. One cherry tree and one apple tree in the backyard. If the yard was bigger I would for sure have more cherry trees. There was an artist who lived on Cherrywood Ave. When her children were young they went to a school called "Cherrywood." The artist and her husband had a cherry tree, and her husband made cherry pie every June. Nice story you wrote and true. I wish you hadn't mentioned the pie part. That is without a doubt the most delicious thing I eat all year. I love this scene! It is so amazing that you make it look different and fresh each time. Terrific color combos in this one. Congrats on the award and thanks so much for passing it to me! Thank you so much. Of course it is different every time. But I'm searching madly for a different view. back yard. I've been checking that out. Thanks for your kindness. You totally deserve the Sunshine Award.